We all have certain chores that we don’t mind doing. Some people prefer washing dishes over vacuuming or taking out the trash over dusting the shelves. If you have more than one person at home, these tasks can be split up accordingly. But when you live alone, all of these tasks fall to you. And aside from picking up that one string the vacuum refused to pick up, I have to say one thing I find extremely tedious is changing the sheets on my bed. It starts with simply ripping off the covers and throwing the pillows and blankets in a heap on the floor with dramatic flair—and about 1/100th of the time it will take me to remake the bed. It’s at this point I realize there’s no turning back and swallow a small lump of panic. With the old sheets in the basket and the new sheets still folded in a pile, I am now committed to following through with the process if I want to sleep on sheets ever again. Exhausted by the thought, I take the sheets from the shelf and let them rest on the bed for a bit while I rest for a bit on my own. I will usually get (intentionally) distracted by something more interesting like watching the squirrels and cursing Disney movies for leaving me so disillusioned about small woodland creatures and their willingness to help me with chores. But I steel myself up and return to my task, plowing through the bottom sheet and two pillows and fighting with the corners of death. The only thing harder than fitting the elastic-ish corners of the bottom sheet across each of the four ends of the mattress without one popping off every time is actually folding the bottom sheet when it comes out of the dryer. Enter a quick break to test out the sheets and pillows, at which point I stare at the ceiling and decide I should probably wipe off the ceiling fan at that exact minute. About 20 minutes later I continue on with my journey of placing the top sheet on with equal amounts of sheet on either side of the bed. But no matter how hard I try, I end up walking back multiple times to pull the sheet a little bit more on one side before tucking it under the mattress. If it’s too short on one side, I end up pulling the whole thing out when I get into bed. If I pull it too far up the front, my feet will poke out of the bottom and there’s a good chance I’ll wake up with the excess sheet wrapped around my head and panic that the cat’s trying to smother me. Anyway, once sheet side distribution is complete, I triumphantly throw on the blanket with the flair of a matador waving his flag. After ensuring equal blanket distribution—see sheet step above—the task is finally complete a mere 45 minutes or so later. I’m exhausted just thinking about it, but at least now the bed will have sheets. 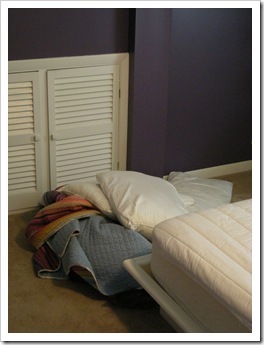 This entry was posted in Uncategorized and tagged changing my sheets, cleaning, domestic things, living alone. Bookmark the permalink. I literally just changed the sheets on my bed so I know well of what you speak! Add in the fact that for some reason our new mattress weighs about 1,000 pounds; which makes tucking the sheets in a real workout. I keep hoping the house elves will do it for me. I also keep hoping for house elves. I only have the one set of sheets so the likelihood of me completely losing interest in the chore by the time the sheets have been washed and dried is about 100%. 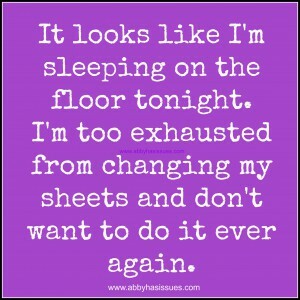 I will even confess that I have on occasion crawled under my uncovered duvet to sleep on a bare mattress. The process of thinking about changing the sheets takes hours, then I have to contest with the “help” I get from the pups while I’m actually changing the bedding. I’m exhausted already just from the thought of it! Love it! But try doing all of that with 4 or 5 cats racing around the bed thinking this is a fun game. I can’t tell which are the long sides on the bottom sheet and put it on wrong every. single. time. I also have to shut my dog out of the room if I actually want to accomplish the changing of the sheets. Now that there is only one of us (me)sleeping in my king size bed, I don’t worry about the exactness of the sheets and or comforter. 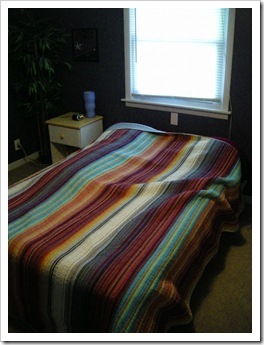 As long as my side (which is the side that shows if anyone looks into my bedroom) is adequately covered, I’m good. But my cats do love to “attack” the sheets when I am trying to make the bed. I’m dreading tomorrow because it’s sheet-changing day. The worst thing is I don’t change the blasted things! My home help does that horrible task, but I still hate sheet-changing day. 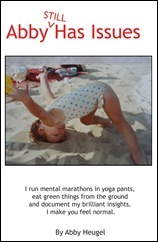 Yes, I’m weird, very weird. PS: I love the colour of your walls. Oh dear, this is so accurate! I have a duvet as well as a blanket, with it’s cover. And putting that thing on is the EFFING worst! 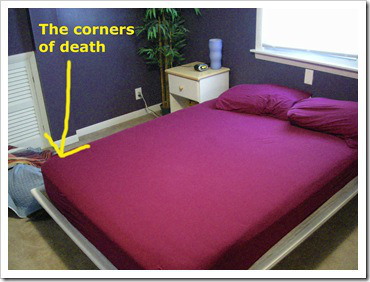 I have to put the duvet-corners in it’s respective cover-corners, only to notice I’ve got the wrong side. After getting the right side in, I put the corners in my mouth (and almost vomit every time- that texture in my mouth makes me gag), and jump up and down to get the cover all over the duvet, then I have to climb OUT OF THE COVER myself. Repeat blanket step. Yes. And I recently got an egg carton thing for the top of the mattress (ideally to keep me cooler, but it doesnt seem to be working). So now there’s an extra layer of hell when I try to put the bottom sheet on. Sigh. This definitely sounds about right. 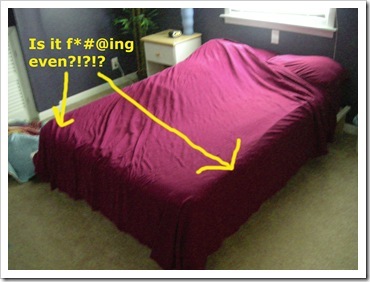 Too funny that we all have the same issues doing such a simple task as changing the sheets on a bed. I feel like 50% of the time I should get the bottom sheet on right on the first try. Yet, it only happens like 10%. The odds are not in my favor. Damn bedding. I feel so much better now. Not the only one. 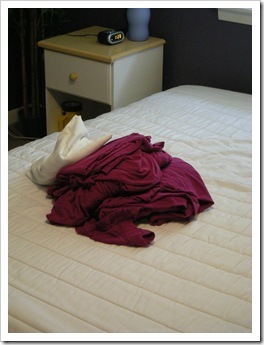 How does one fold a fitted sheet? It’s the works of Satan, I tell you. That’s great!! I will try. I always have difficult in doing this.